Collector owned and in mint condition. Here's 2015 Gibson Limited Edition AJ Custom Advanced Jumbo Slope Shoulder dreadnought acoustic-electric. Limited to only 65 instruments, this limited edition features the added versatility of a built-in L.R. Baggs Element VTC pickup with soundhole-mounted volume and tone control. Includes a signed Certificate of Authenticity, hardshell case with plush-lined interior. The idea of buying a new guitar straight off the rack, that is comparable to the great vintage Gibson J-45 models, is pretty mind boggling. The idea of getting a pro-level acoustic with all solid wood construction, nitrocellulose finish, beautiful sunburst, and Adirondack Spruce top for under $1200, is also mind boggling. The Eastwood E10 SS is totally comparable to the old Gibsons in sound, tone, playability, and looks...and that is just a wonderful thing. This is a really serious guitar. It's not that it's great-for-the-money, it's just GREAT. 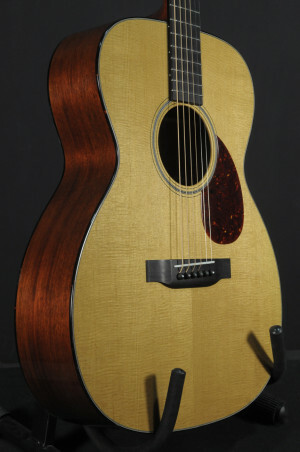 The "Large Soundhole" made its first appearance on a Bourgeois dreadnought back in 2014 as a tribute to one of Dana Bourgeois' heroes. We were immediately impressed with the tonal flavor it lent our standard design, begging the obvious question; What would a Large Soundhole on our OM sound like? Introducing the "Large Soundhole" OM, Bourgeois' latest in a long run of vintage-inspired innovations. Since it's birth, the Large Soundhole OM has become an instant hit among flatpickers seeking smaller bodied alternatives. With striking tonal similarities to the Dreadnought, this acoustic offers improved ergonomics and accommodates a large diversity of playing styles. Featuring aesthetics associated with "holy grail" dreads, this model is a perfect representation of Dana's constant innovation of the Vintage flattop. Neck Profile: Traditional Even "C"
Body Dimensions: 14-3/8" x 4"
The Traditional or "T" Series guitars reflect Bill Collings' return to his guitar making roots and offer a new tonal variation on the distinctive Collings sound. Each T Series guitar is built using animal protein glue and a very thin all nitrocellulose lacquer finish, making them exceptionally dynamic and responsive. Bracing and tone woods are adjusted for weight and thickness to create a voicing characterized by warm, rounded highs and a present low midrange, while retaining a quick attack and strong projection. Each Traditional series guitar will come with a handmade lightweight Collings case designed and built in the Collings shop. The pairing of these new Traditional guitars and cases makes for a combination of old world quality and aesthetic that is unprecedented among instruments available today. To introduce the new Advanced Slope D, Bourgeois is offering a special limited edition of 12 guitars. It features Bourgeois's Aged-Tone Adirondack Spruce top, with Brazilian Rosewood back & sides, and a special inlay in the bridge wings. As always, all of the sunbursts are applied by Dana Bourgeois himself. When Eric, (Our beloved leader) asked me to describe this guitar, I was quite frankly, intimidated. I open the case and I was stunned. How can mere words possibly do justice to this fine instrument? We have a new Bourgeois Slope D-Advanced Limited Edition. The top is Aged Tone Adirondack Spruce, back and sides are Brazilian Rosewood, (that's right, Brazilian), 14 frets clear of the body, Ebony peghead veneer, fingerboard is Guatemalan Rosewood, Waverly tuners, Sunburst finish on top, firestripe pickguard. I wonder if it sounds any good? Well, I'll be darned, it sounds phenomenal. Why am I not surprised? This is one of the best acoustic guitars we have had in a while. This guitar is stunning not only in looks but also tone, it's a work of art that will inspire future guitarists for many years. Don't you just love the smell of Brazilian Rosewood in the morning? It smells like a good time is just right around the corner. A good time will be had by all that play this fine guitar. We are offering a limited edition 2015 Taylor 714CE Brazilian Rosewood acoustic electric guitar. This is a Cites Compliant guitar, it is stamped on the label. The back and sides are spectacular Brazilian Rosewood. Check out the gorgeous figuring and sap wood! This is a lovely guitar: lovely in appearance, lovely in tone. The Torrefied Sitka spruce top combined with the Brazilian Rosewood back and sides produce lush trebles, warm and punchy bottom end...a lively sound with great overtones that are almost 3-dimensional in character. It is set up with the ES 2 Expression System pickup, has a single cutaway with an ebony fingerboard, and a pearl rosette. The action is perfect...everything is perfect about this guitar. It is a used guitar, but it would be better described as "pre-owned" because we can't find any signs or wear at all. Perfect condition and looks absolutely gorgeous. It's one of the best sounding guitars we have in the shop right now, and one of the most satisfying guitars we've played in a long time. Comes with original hard case. © 2016 Martin Music. All Rights Reserved.